Relatives: Son of Thomas and Emily Peacock. Grandson of Emily Atkins. Address: Grandmother's house; 104 High Street, Hadleigh, Suffolk. Thomas Gordon Peacock was the eldest son of Thomas and Emily Peacock. He was born in Croydon in 1894 and known by his middle name of Gordon. This was probably because his father was also named Thomas. By the time of the 1901 Census he was 7 years old and living at home with his parents and siblings; Joyce (5) and John (2). His mother Emily Cecilia Maude (nee Atkins) was born in Hadleigh, the daughter and grand-daughter of Hadleigh GPs. In 1909, Gordon's parents divorced, which might explain why he ended up living in Hadleigh with his maternal grandmother. By the time of the 1911 census, Gordon was 17 years old and living with his Grandmother, Emily Atkins at 104 High Street and was employed as an ‘Articled Clerk’ working for a chartered accountant, which might be another reason for him coming to Hadleigh. At some point Gordon entered university. He was commissioned directly from university into the Royal Berkshire Regiment. His commission was assisted with the help of Dean Carter of Hadleigh who gave him a reference. By September 1915 he was 21 years old and we think he was serving as the Adjutant of the 8th Battalion The battalion was in the area of Loos preparing for ‘the big push’. The ‘Big Push’ was the allies first large scale major offensive at Loos. The battle was to take place over a broad six-mile frontage in the French coal mining and industrial area extending from the La Bassee Canal, south to the town of Loos. The action began early on the 25th with the disastrous first use of gas by the British. "I wish I had been a better brother to you". His body was discovered on what would have been his 22nd birthday. He had his mother's card in his hand alongside two sprigs of heather. His body was initially buried by the Hulluch Road, however as the battle raged he was eventually lost. 21 year old Lieutenant Thomas Gordon Peacock, is commemorated on the Loos Memorial which surrounds Dud Corner Cemetery. The cemetery stands on the site of a German strong point that was captured by the 15th (Scottish) Division on the first day of the battle. The name Dud Corner is believed to be due to the large number of unexploded enemy shells found in this area after the Armistice. 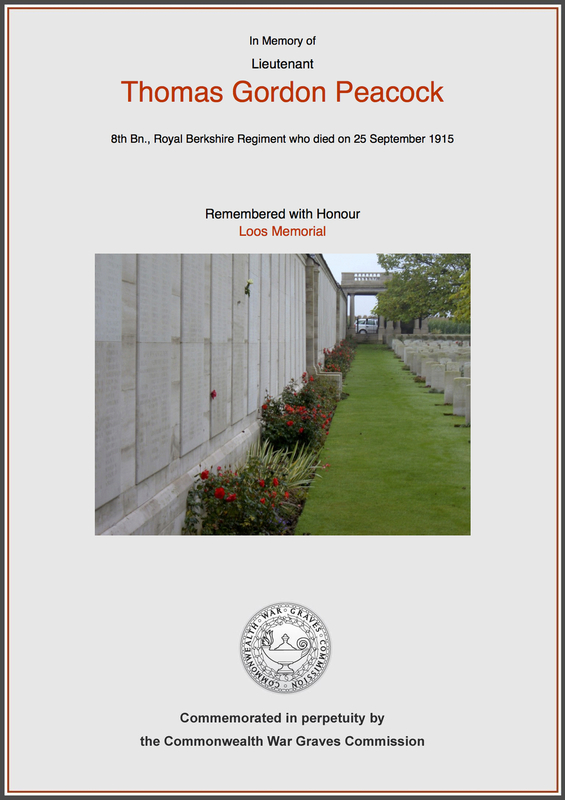 The 8th Battalion of the Royal Berkshire Regiment, were part of the 1st Brigade of the 1st Division. The Division’s advance began a few minutes late, after they suffered casualties from the British gas which had drifted back into the assault trenches. The 1st Brigade did not suffer so badly from gas and the lead battalions; the 10th Gloucesters and 8th Royal Berkshires, both New Army units that had replaced Guards battalions in the Division in August 1915, advanced through all their objectives despite heavy casualties. By 8.00am they were in Gun Trench. The Loos Memorial commemorates over 20,000 officers and men who have no known grave. On either side of the cemetery is a 15 feet high wall, with fixed tablets on which the names of the missing are engraved. Gordon is also remembered in the University of London Officer Training Corps Roll of Honour as well as on the Hadleigh Town Memorial and Roll of Honour. In 2015, a book was published that told the stories of all the men pictured in a 1915 military group photograph. The book was the result of a 21 year history and art project by Andrew Tatham, who is the Great Grandson of one of the men in the photograph. Andrew's Great Grandfather was the commanding officer of the 8th Battalion of the Royal Berkshire Regiment and is sat in the front, centre of the photograph (numbered 34). We hope that this page has been able to tell the story of Lieutenant Thomas Gordon Peacock. If you know of any information which might help to add to the story then please get in touch.